Whether you travel solo, with your family, a group of girlfriends or with a significant other, it’s nice to challenge yourself a bit when you’re in a new place. Getting outside of your comfort zone can come via many ways, whether you go somewhere with a foreign language or where the customs are quite different or whether you have to navigate and get around by yourself or combat shyness to meet new people. Another way to stretch yourself is physically, through adventurous activities. This doesn’t have to mean bungee jumping from great heights or jumping out of a plane, though. Why not have some fun, see things from a different point of view and get your heart rate up a bit by ziplining? These days there are all sorts of exciting zipline sites across the globe just waiting to be tried out, including those in the middle of jungles, stretching across waterfalls, in major cities and more. Read on for some you need to put on your bucket list for future travels. Head to the northern part of Costa Rica, to the area of Arenal, for a memorable zipline experience operated by Sky Adventures. Here, the tourism operator runs its approximately two-and-a-half-hour long Sky Trek tour, which is advertised as the most thrilling zipline in the nation. The reason for this notoriety is due to the experience’s location. Based near the Arenal Volcano, which was one of the most active in the world until 2010 when its eruptive phase paused, the tour starts with an open-air gondola ride up to an observation area which is 4,100 feet high. From this platform you’ll get an amazing view of the volcano and surrounding regions, before zipping your way through treetops, over canyons and down mountainsides on a zipline. There are seven ziplines in total and around half a mile of course. As you zoom through the air, you’ll even get the chance to spot native animals in their habitats below. As such, there are many things to love about this offering. Niagara Falls is a natural wonder which draws millions of tourists to the border between Canada and the U.S.A. each year. While there are lots of great ways to see these powerful waterfalls, including from many of the top Niagara Falls hotels, which boast bedroom views, you should also book a ticket for yourself at WildPlay Niagara. At this popular attraction, complete the Whirlpool Adventure Course, a multiple zipline obstacle course that sees visitors traveling at about 220 feet off the ground. The best bit is that as you fly at up to 40 miles per hour on three different self-paced zipline adventures, you’ll get the chance to see Niagara Falls from above — the ziplines cross the gorge and whirlpool. While Hawaii is particularly famous for its beaches and friendly, laid-back culture, the islands also happen to offer many great adventure opportunities for tourists. When it comes to ziplines, it’s hard to go past the Skyline Eco-Adventures tour on Maui. It soars near the jagged peak of Haleakala volcano, which dominates the island’s skyline. 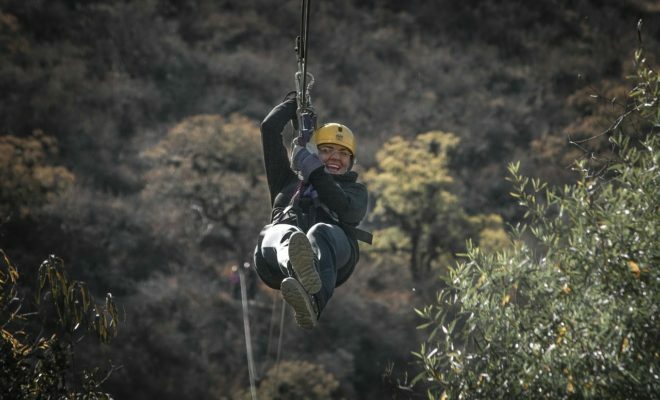 The first zipline tour built in America, this course today includes a five-line interconnected experience that provides excellent views of the volcano in addition to nearby valleys, forests, ocean and mountains. When completing the course, you will surely feel your heartrate rising as you reach speeds of more than 45 miles per hour and zip across 90-plus-foot drops. If you’re planning to head off to Asia at any stage this year, particularly Thailand, don’t miss a visit to the Flight of the Gibbon zipline operation. Located outside Chiang Mai city, this experience is something you won’t forget as it will have you zooming over green rainforests and jungle canopies, which gorgeous gibbons call home. There are 33 different platforms in total here and more than three miles of lines to enjoy. Plus, this tour operator is a one-stop shop; they run daily excursions to pick up ticket holders from the city and transfer them to the zipline facility, and they include a short jungle trek to see the acrobatic gibbons closer up as well as a lunch to refuel, too. Another benefit of putting your tourism dollars into this company is that they donate a percentage of profits from every ticket to gibbon conservation projects, to help protect the threatened species.